Why does ESPN insist on screwing with Mets fans by having Steve Phillips do color commentary for Mets games? It makes my blood pressure rise every time! He always seems to brag about something he did right (Yes, Steve, we all know you drafted David Wright), but never mentions trading away Jason Bay. Deep down you know he wants to see the Mets fail because he doesn't want to see Omar succeed at what he failed to do. I grew up in Elmont, NY, and lived there for most of my childhood and young adulthood. Elmont isn't the same as when I grew up, but I know some things still remain, like King Umberto's Pizza, A Cut Above (nee John The Barber), Sapienza Bakery, Covert Avenue School, and Belmont Racetrack. In a few short hours I'll be boarding a plane to LaGuardia airport to spend a nice weekend in the city, capped off by my favorite holiday of the year - Opening Day. I expect the weather to be lousy, the food to be as terrible as always, and to love every minute of it. 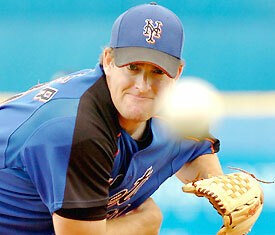 The Mets must be real annoyed right now by the news that Anna Benson is divorcing Kris Benson. It's baseball's worst kept secret that the reason Kris Benson was traded to the Orioles was because his wife was an embarrassment to the organization. Now if Benson has a great year and/or Jorge Julio has a terrible year we can wonder what might have been. Yankees camp should be a fun place to hang out today. Bud Selig will announce today that MLB is launching an investigation into players who've been accused of steroid usage, namely Jason Giambi, Gary Sheffield, and some guy on the Giants. No one is sure what MLB will do once the investigation proves that players used the illegal substances, but as a Yankees hater you gotta love the circus this will bring to the Bronz Zoo. At the end of last season, the projected rotation for 2006 included Benson and Seo, with Aaaron Heilman as the odd man out. Now, with Opening Day merely hours away, Heilman again finds himself in the bullpen, now with rookie Brian Bannister coming out of nowhere to claim the fifth spot in the rotation. So who is this guy and where did he come from anyway? So this guy has only pitched in 8 games above AA, and he still was awarded a starting slot, as Rick Peterson has been impressed with not only his pitching, but also his makeup. Bannister is a five-pitch righthander who's out-pitch is a nasty curveball, though according to Rotoworld his stuff is "below average." Brian's father, Floyd Bannister, was a left-handed strikeout pitcher for the Astros, Mariners, White Sox, Royals, Angels and Rangers from 1977-1989, pitching to a 91-92 record in that timespan, and Brian's younger brother Brett was drafted by the Mariners last year. If pitching doesn't work out, Brian is also a professional photographer, owning a studio in Phoenix called Loft 19, where he calls ESPN, Nike, and LPGA his clients. I don't envy Mets management. They recently had to deliver tough news to their players. 1. My prediction for the Mets' Opening Day second basemen officially became "wrong" today as Jeff Keppinger was sent down to AAA. Consolation for me, but certainly not for Jeff, is that he actually put up the best offensive numbers of all players competing for the job this Spring, but Omar and Willie apparently feel that Anderson Hernandez provides a better balance of defense and offense. I still don't think we've heard the last of Keppinger, but it has to be a bit demoralizing for him to get demoted, even though he's done everything that could have been asked of him. 2. Aaron Heilman also got some tough news, as he was officially beat out for the 5th starter's job by Brian Bannister. Heilman was the odd man out at the end of last season even though he was "lights out" as a reliever, but seemed to have been handed the 5th starter job when Anna Benson's husband was shipped off to Baltimore. Heilman had an awesome spring, but Bannister had an even better one, so it's back to the 'pen for Heilman. I feel bad for the guy, but it's also pretty cool that a Mets rookie won out a job in the Spring Training in a year that the club is built to win now, as opposed to a say, a rebuilding year that's more about the future than the present. Pedro Martinez finally pitched in a game yesterday, allowing just one hit over three innings. This puts him on target to pitch in the third game of the season, April 5th vs. the Nationals. There should be a good crowd at Shea that night, for an April Thursday, and Vinny at Metsville says the fans are in for an extra treat that night, because QueensrŸche frontman Geoff Tate will be singing the national anthem. I haven't heard who will be singing the anthem on Opening Day (though I hope it's not Glenn Close), but all this talk reminds me of the best version I've ever heard, which was during the 1999 playoffs. Believe it or not, it was Cindi Lauper. I can't explain to you exactly what made it so distinctive, but she did an a capella interpretation that was somehow so moving, and so interesting, but still very true to the version we are all accustomed to. Were any of my readers, I mean, were either of my readers in attendance that night that remember that memorable version? Where do I start? First of all, BBQ in NYC? That might have held some interest before I moved down South and found out what REAL barbecue tastes like. Next, a show called Inside Poker. I just played poker for the very first time last weekend. I had a good time, but I am not nearly into it enough yet to watch people play it on television. Beach Volleyball. That, I could get into, assuming WC means "womens championship," but I can't be sure. Finally, what the hell is NLL? Everyone seems to believe there will be an agreement before Opening Day. Based on this afternoon's lineup of programming, I think I can be patient.